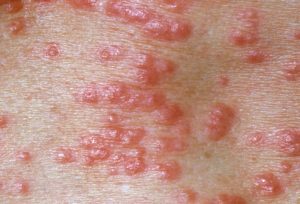 Scabies results in itching and a rash which are small red bumps or pimples. The rash typically begins in the webbing of the hands or feet but then spreads to the arms, legs, stomach and back. Scabies is caused by a human mite that burrows into the top layer of the skin. This 8-legged bug is so small that you cannot see it on the skin. Scabies is contagious and often an entire household will need to be treated to fully eradicate the infection. Treatment options include prescription topical anti-scabies cream and in severe cases, oral anti-scabies medication. In all cases it is very important to sanitize all bedding, clothing, towels and other items that come in contact with your skin within the past 6 weeks. It is also important to vacuum your home and then throw away the vacuum bag or sanitize the vacuum canister when finished. The dermatology professionals at Kentucky Dermatology can assess your skin lesions and discuss your treatment options.